Two professional 'wine guides' introduce themselves as 'Sommeliers'. The banter between the two 'professionals' however, is far more engaging than the subject at hand. As this comedic presentation builds, the male turns his attention to a woman in the audience, comparing her to a silky smooth Chardonnay. 'She is more than a woman...she is an opera!\' he exclaims, bursting into song and espousing how all woman are like wine. The female Sommelier strips off her apron - revealing a glamorous gown underneath. She sings Carmen's Habanera replacing the original french lyrics with a humorous English translation - all about men! Low and behold, she bumps into an 'ex-lover' (a guest) - and the fun continues! 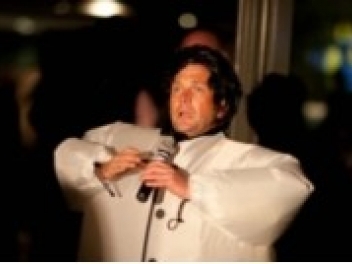 In a blow up suit, 'Pavarotti' enters, singing about his life, his women, spaghetti and the tricks he plays on the tax man. Comedy, surprises and inspiring song!